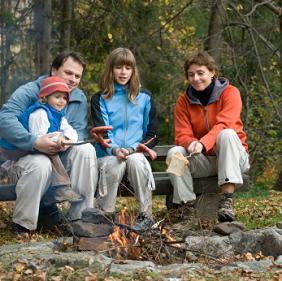 Camping is a great summer activity that you can enjoy with your entire family. Unfortunately, when you are out in the wilderness for an extended period of time, it may be difficult to care for your teeth. These tips can help ensure your mouth is healthy while you camp. If you forget your toothbrush, a cloth or paper towel may be a suitable stand-in. Wet the cloth, wrap it around your finger, and use it just like a toothbrush. If you don't have a toothbrush, the best thing you can do for your mouth is to rinse it out frequently with water. This will keep bacteria and food particles under control. This is especially helpful right before bed and after you eat. Swish the water around your mouth and spit when done. Make sure you drink enough water, too, to stay hydrated and fight dry mouth. Another good way to keep your teeth clean while away from modern facilities is to chew sugar-free gum. This will help to rid your teeth of food particles and debris. Plus, it will also stimulate saliva production, which is a natural way to keep bacteria off of the teeth. If you can, pack some fresh produce for your trip, choose crunchy vegetables like carrots or celery sticks. These vegetables can help to clean your teeth after a meal. Stick to the raw option and don't dip them into anything. This natural toothbrush will help to keep your teeth clean and shiny until you get back to modern civilization and your precious toothbrush. Don't let your fun summer activities keep you out of the dentist's office. You still need to visit us every six months to maintain good oral health. Call us today to learn more.